"MARS," a six-part miniseries premiering on National Geographic Channel, combines feature film-quality scripted drama and visual effects with documentary sequences to tell the story of humanity's quest to colonize Mars. Humanity is still years away from landing on Mars, but the first documentary to look back at that achievement is already complete. 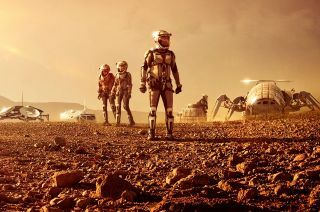 The six-part television docudrama "MARS," premiering on the National Geographic Channel Monday night (Nov. 14), chronicles the first mission to the Red Planet in 2033 using footage of the crew's activities on the surface and through "flashbacks" to 2016, when the journey to Mars began. "I think it is surprisingly and almost shockingly, in a way, as accurate as it could possibly be," said Stephen Petranek, author of the book "How We'll Live on Mars" (2015, Simon & Schuster), which served as the basis for the production. "The idea here, originally, was to make this as entertaining as possible so you'd get a large audience, but that people would actually learn something while watching it." "I really think we pulled that hybrid off," Petranek said in an interview with collectSPACE. "I'm surprised, frankly, that it worked so well, but it does work. It is strikingly accurate." "It is really not a fictional part," explained Petranek, "it is an accurate imagination of what is very, very likely to happen and much sooner than people expect." "There is this guy named Elon Musk and he is probably going to put people on Mars within ten years and that is going to change everything about life on Earth," Petranek said. "When we become a multi-planet species, it'll be the most cataclysmic event that's occurred ever since humans started walking upright two million years ago." Musk, who is the CEO of SpaceX, appears in "MARS" as part of the "flashback" interviews that are set in 2016. The first episode includes scenes filmed in SpaceX's assembly facility, at its mission control, and at its successful — and unsuccessful — Falcon 9 rocket launches and landings. The Daedulus spacecraft in National Geographic Channel's "MARS" miniseries shares a resemblance to SpaceX's Interplanetary Spacecraft. "The entire company has one mission and that's to build a sustainable civilization on Mars," said Petranek. "SpaceX is the one that is pushing this, across all platforms." Not that "MARS" was only influenced by SpaceX. Though the Daedalus spacecraft bears a passing resemblance to Musk's recently-revealed Interplanetary Transport System, the documentary features a slew of subject matter experts from both commercial and government space agencies. NASA Administrator Charlie Bolden, as well as Jim Green, NASA's planetary science director Jim Green and Jennifer Trosper, the manager for NASA's Mars 2020 rover mission at the Jet Propulsion Laboratory are among the U.S. space agency representatives in "MARS." Others interviewed for the miniseries include Neil deGrasse Tyson, director of the Hayden Planetarium; Peter Diamandis, chairman and CEO of the XPRIZE Foundation; Roger Launius at the National Air and Space Museum in Washington; Andy Weir, author of "The Martian," and Jim Lovell, Apollo 13 commander. "We just got really smart people who really know what they are talking about," said Petranek. Directed by Mexican filmmaker Everardo Gout, the series was executive produced by Ron Howard, Brian Grazer and Michael Rosenberg of Imagine Entertainment. "Any story about a true life adventure is a story of courage and heroism, and Mars is as well," said Howard in a video released by National Geographic. "But it is not just getting there, it is building the base, it's colonizing it, it's surviving. We are dramatizing what we think the experience might be like but it's not fiction, it's very much based on research." The international Daedulus crew in "MARS." "Everything that is scripted is based on the individuals who we [interviewed], explaining to us what the first explorers and colonizers to Mars will most likely have to face," said Howard. Filmed in Budapest and Morocco, the scripted portion of the series features actor Ben Cotton as American mission commander Ben Sawyer; JiHAE as both Korean-American mission pilot Hana Seung and her twin, capcom (capsule communicator) Joon Seung; Alberto Ammann as Spanish hydrologist and geochemist Javier Delgado; Sammi Rotibi as Nigerian roboticist Robert Foucault; Clémentine Poidatz as French physician and biochemist Amelie Durand; and Anamaria Marinca as Russian exobiologist Marta Kamen. Olivier Martinez portrays the French chief executive of the Mars Mission Corporation, which sponsors the Daedalus. "I hope that our telling of this story of going to Mars will stimulate people's imaginations, because I think that'll also open their mind to this exciting possibility that is there for us," said Howard. "MARS" is premiering on the National Geographic Channel and Nat Geo Mundo in the United States on Monday (Nov. 14) at 9/8c. The event series began airing internationally in 170 countries and 45 languages on Sunday. Watch a behind the scenes clip from National Geographic’s “MARS” at collectSPACE.